Party outfits, sports team-wear or your own stylish piece to make a bold style statement … the uses of custom zip sweatshirts and hoodies are endless. Just create the perfect design for your custom zip hoodie or sweatshirt, and we’ll do rest. The entire process is simple and snappy thanks to our handy online designer. 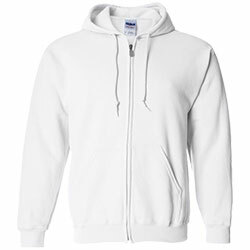 Our catalog boasts of an amazing selection of zip sweatshirt styles and colors from fantastic brands like Gildan. Start designing today to take advantage of our free and fast shipping without minimums.